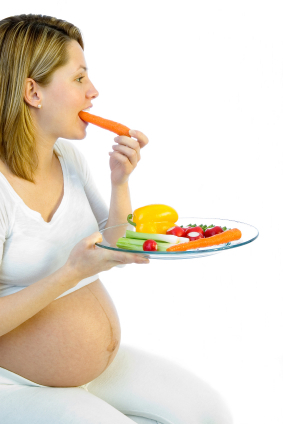 Expectant mothers often make dietary changes and when they experience "cravings" for certain foods during pregnancy. It is important not to gain excessive weight. A healthy diet with foods from the food pyramid is suitable. Additional amounts of milk will be needed for calcium. Extra servings of cereals, fruits and vegetables are also recommended. as they are also high in fibre. Group 3 - potatoes, sweet potatoes, carrots, and all root vegetables. Group 4 - leafy green vegetables, cabbage and celery. A lot of women complain about constipation during pregnancy. This tends to occur in the second or third trimester especially when the baby is pushing down and there is pressure on the bowel from the enlarged uterus. Iron supplements can also cause constipation. A diet high in fibre can lessen constipation problems. It is important to increase water intake (8-10 glasses a day) at the same time to help the fibre to work in loosening stools. Ensure a daily intake of fresh fruits, raw leafy green vegetables,cabbage, broccoli, spinach. Do not peel fruit - eat it with the skin. Wherever possible, cook vegetables with the skin. Choose whole fruits or vegetables instead of juices. Each meal should contain wholegrain cereal, rice or noodles. Replace some of the white rice with brown rice. Choose bread and cracker products made from wholemeal flour (oats, wheat, rye) instead of white flour.